We loved her too dearly to forget. 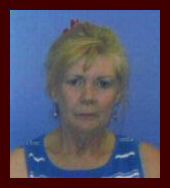 65, homemaker, died Sunday in Vinta. December 13, 2009 at Craig General Hospital in Vinita, Oklahoma. She was born on January 13, 1944 in Joplin, Missouri to Clinton and Nadine (Harper) Wood. Sharon received her LPN certificate from NEO in 1970. She loved horses and country western music. Survivors include her daughter, Terri Wyatt Maloney of Afton; her son, Scott Wyatt of Grove; four grandchildren, Joshua Wyatt, Clint Glover, Shawna Maloney and Shanna Maloney; her aunt Sybil Baker. Funeral services will be held on Thursday, December 17, 2009 at 2:00 p.m. at Worley-Luginbuel Funeral Home Chapel in Grove. Rev. James Wilder will officiate. Burial will follow in Ballard Cemetery, Bernice, Oklahoma. Visitation will be from 1:00 to 2:00 on Thursday prior to the service.